Achilles dropped to the ground, raising his shield to ward off the rain of arrows that showered around his head. Despite his nigh invulnerability, he had a bad feeling as the flaming arrows descended. Thankfully, the shield took the bulk of the bowshot. His muscles tensed, absorbing the impact. He dropped the shield and charged. Behind him, four of his finest Myrmidon Hoplites followed him to the Norse position. Everything had been fine while they had fought on the Fields of Troy, but whispers of Athena urged them on – to the strange membranous barrier that separated this world from the next, and through it. The instant he pushed through into the next Shard, the world changed. A dense wood enfolded him, thick mist swirling around runed stones and long-dead soldiers, now just moss-covered skeletons. This was not their home, but he could sense Athena urging him still onward. The Norse were close. This was their Shard, but it wouldn’t be for long. The world of Tempest: Shards of the Gods has already ended. The apocalypse has come and the universe shattered into countless pieces. All that remains are the Shards, pieces of former worlds collected by the gods, who fight for dominion over what is left. The Shards are central to Tempest. They are kingdoms, dominions, realms and a universe of their own. Between the Shards, there is nothing – only æther and emptiness. Within the game, players choose their Shard when constructing their deck. Each Shard has 15 cards associated with it, which are linked thematically and mechanically to that Shard. The Greek Shard, Flood Plains is themed around chariots and flanking tactics; while the Japanese Shard, Shrine of Cherry Blossoms is tied to priests, priestesses, komainu guardian statues, and a festival of cherry blossoms. There is a great deal of synergy within the 15 cards that come with a Shard and players are encouraged to use all 15 of those cards in their tactics during a game. By selecting a Deity, Temple Shard and a Battleground Shard, players construct a 45 card Research Deck to play with. A Neutral Shard is one available to any player, and these benefit both sides of the conflict. A Shard is like a pocket universe. Some are large (like the endless Ancient Woods) while others are very small (like the Island Acropolis). Those that have been claimed by the gods (Temples and Battlegrounds) tend to be hardier than those fought over (Neutral Shards). Either way, conflict within the Shard damages it and potentially collapses it. 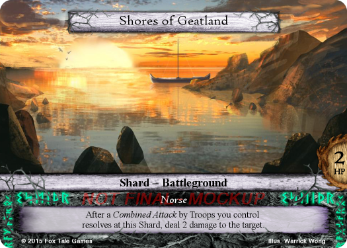 The Shores of Geatland Shard comes with 15 cards: five Geatish Men-at-arms, along with their leaders (Beowulf, Hrothgar and Wiglaf) and their enemies (Grendel and the Dragon of Earnanæss), the sword Nægling, two Tales to complete (the Halls of Valhalla and the Saga of Beowulf), and two Hunt the Monster Event cards that help your Troops by granting them Combined Attack (the ability to attack together to take down powerful foes). Accordingly, the focus of these fifteen cards is on using Combined Attack to fight more powerful foes. While a Neutral Shard benefits both sides of a conflict, the Battleground and Temple Shards benefit only their owner. This gives a bit of a boost to the defender and prevents one player winning due to an early lead. Shards are set out as below, beginning with a player’s first Shard (their Temple), second Shard (Battleground), a combined zone constructed of two Neutral Shards, then on to their opponent’s Shards. Unless specified otherwise, all Troops a player controls are built into their first Shard (usually their Temple). Troops advance through the Shards, fighting battles when they share a Shard with your opponent’s Troops. When a Combat is fought at a Shard, it is damaged. Notice that the Shores of Geatland only has 2 health (HP). This means that after two Combats are fought here, it is flipped and no longer counts as a Shard. All Troops either advance or retreat from it, and all Structures on it are destroyed. This prevents players from playing an hour-long tug-of-war and brings games to a swift conclusion once battles begin in earnest. While fighting a Combat at Shores of Geatland, the Norse player is encouraged to use the Combined Attack ability: any attacks done by units combining their attacks will deal an additional two damage, allowing even the weakest of Troops to take down the strongest of foes. The best way to win in Tempest is to take note of your Shards’ abilities and play to their strengths. Only 16 weeks and a day until we launch our Kickstarter, and we are working behind the scenes to produce a series of “How to Play” videos for you all. In the meantime, you can check us out on Facebook, Instagram and Twitter for new details! Let us know in the comments what you would like to see next.